operf-micro is a small tool coming with a set of micro benchmarks for the OCaml compiler. It provides a minimal framework to compare the performances of different versions of the compiler. Bigger benchmarks are also available using another tool, operf-macro. operf-micro is available in the official OPAM repository as a self-contained package. operf-micro can be installed in any switch, even to benchmark on OCaml compiler in another switch. If you download the sources from Github, you can use the following instructions to build and install operf-micro. This command will create a sub-directory .operf in the local directory when benchmarks sources are copied, and will later be built and executed. 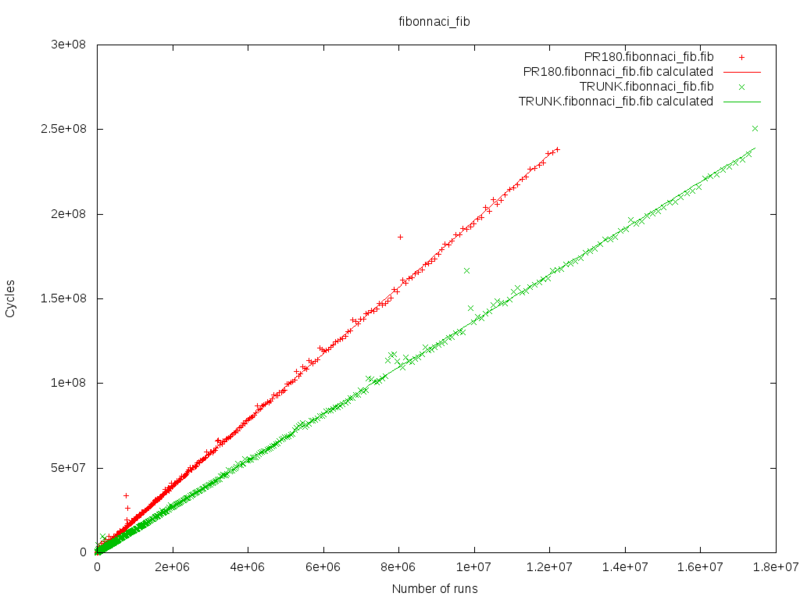 operf-micro runs the benchmarks several times, until the variance is low enough for the results to be significant. This is an advanced description of every command you can run in operf-micro. This command allow you to initialized your run of benchmarks. Once you have initialized your .operf directory is ready to be built. This option is here to help create your own benchmark. It will run the init and build phase on the benchmarks given whithout taking care of the default benchmarks. This will list every benchmarks that have been copied during the initialization phase. If the benchmark have been built then operf-micro will print every functions registered. You can give a name to run the benchmark of your choice or all benchmark by omitting a name. This will prepare the command to run the benchmark then run it and save different informations in a temporary file (number of runs, number of cycles, gc stats...). This temporary file will then be used to generate a .result file. This is the file we will read when printing the results. This command will remove the .operf directory. You will need to start from the initialization phase to run benchmarks. This command will print the results of your runs. If you don't give any name, you will be displayed the list of your runs by their name with the date for each test you made and the name of the function you tested. These informations are retrieved from the $(HOME)/.operf/micro/ directory. If you give the name of a run, we retrieve the informations in the corresponding .result file and display the function name and a score. You can use the option more to display some additional informations. This command will compare the selected runs. If no runs are given, operf-micro will display all the runs. All the results are gathered and we will compare the score of a bench tested in several different runs. Here we have two runs: test1 and test2. Both of them have tested the fft and the fibonnaci benchmarks. We compare the score for each benchmark. You can use the option std-error to display some additional informations. This command will plot the data of the selected bench for the given runs (or all runs). By default operf-micro will plot all the functions of a group in one graph. Since you can have a large number of functions and this can make a graph hard to read, you can choose to plot a function in one graph. You can also select one group to be plotted instead of all the groups of a bench. Operf-micro offers the possibility to generate png of the graphs. This command will do every steps from initialization to displaying the results of the run. You can specify any paramaters that you would if you would have called each step one by one. We are going to take the fibonacci benchmark as an example to explain how to write a bench for operf-micro. A benchmark is a directory which contains a benchmark.ml file or serveral ml files and a benchmark.build file. The .build file describes how to build the benchmark. This is the function that our bench is going to run. This is an array containing the 44 first fibonnaci numbers. Later operf-micro will use this to check that our function is correct. This function allows to generate our argument. Here we just need an integer so the function is the identity. This is the function that will run our bench. Given an argument it will return the argument and the result of the run on that argument. This is the function that will test if our bench is correct. It checks the output against the results array. If it doesn't match we give a message explaining where it went wrong. You will need to use the add function in your bench. This function register our bench so we can later executed it. A good way to get started is to take a look at our benchmarks in operf-micro/benchmarks and file micro_bench_types.mli which contains some types and functions to help you create your benchmarks. Add your bench to the benchmarks dir in operf-micro sources. You will need to recompile operf-micro. When using operf-micro init your bench will be copied and prepared to be executed. You may need to create this directory. Operf-micro scan this directory everytime you use operf-micro init. When initializing you can use the option -I dir to add your bench. This website is edited by OCamlPro. You can contribute information by cloning the project on github.